What is a fledgling? A fledgling is a baby bird that has left its nest but is still being cared for by its parents. They have all of their feathers but they are not fully grown (i.e. short wings and tail) . 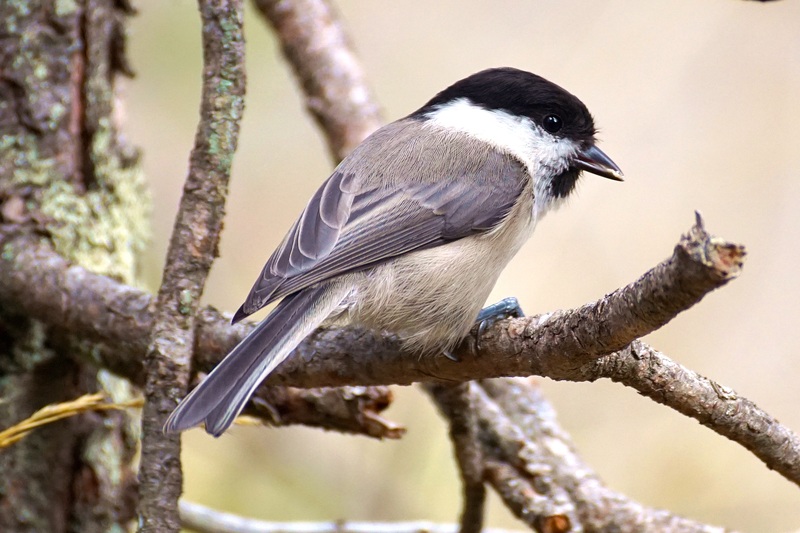 You have probably seen plenty of fledglings this spring/summer already in your yard. They walk or hop around on the ground fluttering making cheeping noises as their parents feed them throughout the day. Fledglings are not yet ready to fly but over the course of a few weeks their flight feathers will continue to grow and their wing muscles will get stronger. The parents will continue to take care of their young as they teach them how to find food and to fly, so that they will be able to go out on their own when they are ready. The time frame will vary with each species. When a baby bird is just hatched it is called a hatchling. It is bald looking and has its eyes closed. The parents will feed it as soon as it is time as well as keep it warm. As the hatchling grows (eyes now open) it becomes a nestling and still be fed by its parents. As the nestling starts to get bigger it will grow its feathers including flight feathers but they are not fully developed. At this stage the nest is beginning to get a little crowded and this is when the parents will lure the nestlings out of the nest. Once the baby bird leaves the nest it is called a fledgling and it will not return there. However, they will continue to be raised by the parents for another few weeks. Why don’t the fledglings return to the nest? Because the longer that they stay in the nest the more dangerous it is for them. It doesn’t take long for predators to start to hear baby birds in a nest and when they do they surely will come looking for food. The sooner a baby bird leaves the nest the safer they will be from any such encounters. Baby birds soon learn how to stay away from danger. 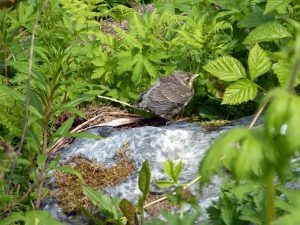 What To Do If You Find A Fledgling? If you happen to see a baby bird hopping around on the ground by itself just leave it alone. Yes, they look so helpless and clumsy but they are very capable. However, if you have any concerns keep an eye on it and look around for any other activity going on. Most likely the adults are nearby either tending to another one of its fledglings, hunting for food, or in a nearby tree watching closely. The babies have to learn survival skills so are probably fine. Trust me if a predator comes along the fledgling will be squeeking and squeeling and making enough chatter to catch their parents attention, who will be there in no time to try to chase the predator away. 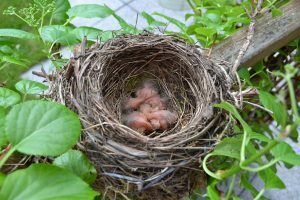 If you are convinced that a baby bird is any type of danger such as a cat or dog lurking about, then move it to a nearby bush or shrub out of sight. The baby bird will make enough chatter that the mama or papa will find it. Note: Some people worry that by picking a bird up that the parents won’t accept it again. However, birds do not have a sense of smell so this is not a problem. Never try to take a baby bird in to raise it yourself. Baby birds usually do not survive in this way by inexperienced people trying to help it. Yes, there is a possibility that they could survive but they will not have learned the essential survival skills to be able to make it out on their own when they are able. Plus it is illegal to keep wild birds in your possession as per the Migratory Bird Treaty Act of 1918. If for any reason that you feel that a bird really needs to be rescued then contact a local wild bird rehabilitator in your area. A nestling is a different story. 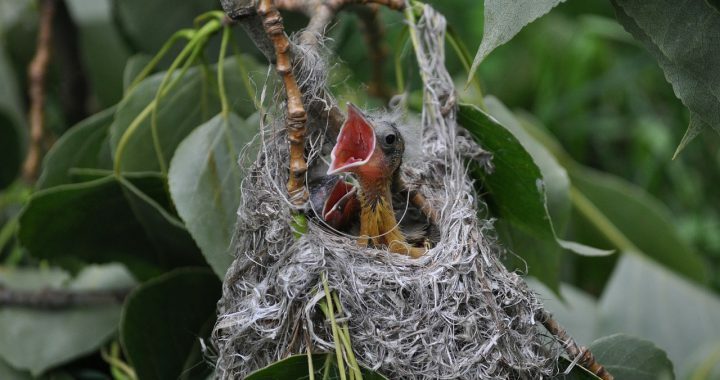 Nestlings can fall out of the nest for a number of different reasons (predators, weather) and since it is not fully developed yet, (cannot stand, perch, or fly), it will definitely need your help. If you can find the nest pick the bird up and put it back in. If you cannot find the nest get a small box, tub, or basket and line it with something soft like grass, moss, or even a paper towel. Place it somewhere safe and close to where you found the baby bird. It is possible that the adults will find it but no guarantees. I know it is hard to see baby birds in such predicaments but sometimes you have to let nature takes its course. I’m sure that you have seen plenty of fledglings in your yard this spring and summer. Watching these little clumsy birds hop around fluttering, and being fed by their mama and/or papa is very entertaining. The parents will continue to feed and teach their babies survival skills until they are fully developed and ready to fly. Sometimes you may have concern about these young birds when you see them out by themselves with the parents nowhere to be found. Take a look around and observe the area though because mama and papa may be out hunting for food, tending to the other siblings, or perched in a nearby tree keeping an eye out for their young. 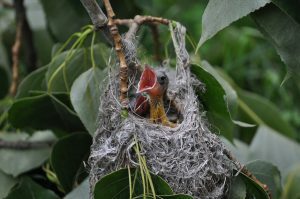 Baby birds make enough chatter that if they are in any type of danger the parents will be there in a jiffy to fend off any predators. 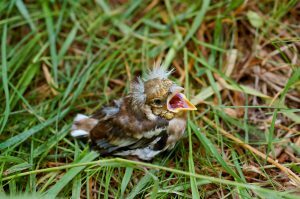 If for some reason you have real concern that a baby bird has been abandoned contact a local wildlife rehabilitation center for help but don’t try to rescue it on your own. Many baby birds end up dying when inexperienced people try to help. Plus, the Migratory Bird Treaty Act of 1918 does not allow you to take in wild birds. If you have any thoughts about this writing please feel free to make a comment in the section below. Posted in Backyard Birds, Songbirds and tagged baby birds, fledglings.